Each notification can be managed from within the admin panel. We display open notifications in the standard wordpress way. You will find basic functionality like bulk deletion, and an overview of all currently active notifications. Its also possible to create new notifications and assign them to customers or visitors. This is great if customers ask you about the availability of a certain product. Just add them to the waiting list, no further actions from the customer is required. Click this button to create a new notification from within the admin section. You can assign notifications to registered customers or any email address. The list showing all currently registered notifications. You can sort by subscribed time, activation status, mails and products. By clicking on the „Create New“ button ( see 1. above ) you are forwarded to a form enabling you to create a new notification. Assign an notification directly to an existing user. By clicking in the field „Search for User“ you can enter the email address or the username of the desired user. Use a wildcard like „*“ after the first few characters to get a search result faster. Next up you use the product search field, select the desired product and you are ready to go. By clicking on the green „Continue“ button the notification will be created. 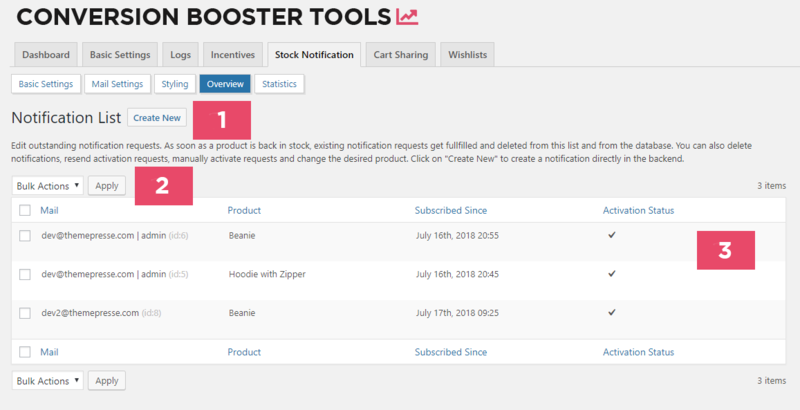 The user will not get an email notifying him about his new stock notification but he will be able to manage his open notifications from within „My Account“. If you want to manually create a notification for a visitor simply click on the „E-Mail“ tab. Now you enter the desired mail address and select the status with which the notification should be saved to the database. You can choose to activate the notification by default. This will not sent an activation mail to the entered email address and activate the notification by default. If you want the visitor to activate the notification choose „Send activation via email“ from the dropdown. After that you simply choose the desired product and click „Continue“. Depending on the defined activation status the visitor will either recieve an email asking him to activate the notificaton or the notification will be activated right out the box. User notifications can be assigned to a different product or deleted. Assigning the open notification to a different product will not trigger an email beeing sent, but the customer will see the change under „My Account“. To delete the notification simply click on the „Delete Notification“ button. In the case of a notification for assigned to a visitor there are some more settings available. You can change the email address and the product assigned to the notification. You can also choose to change the status of the notification by unchecking „Subscription Status“. 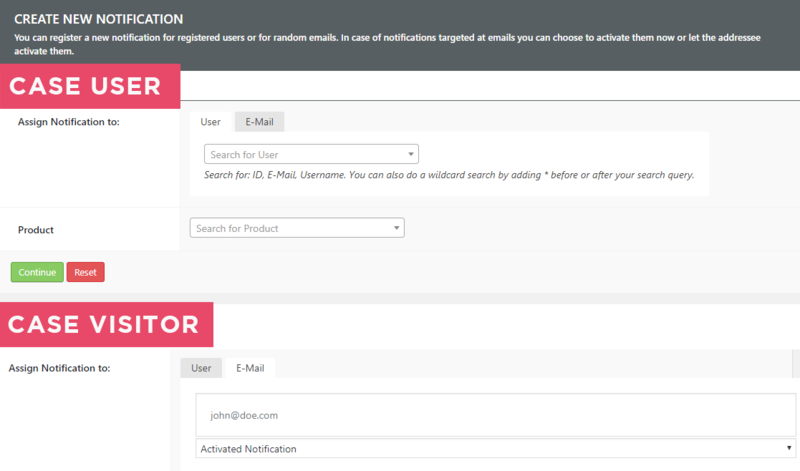 After setting the notification to not active you can choose to send a new activation mail. This can be helpfull if the visitor didn’t receive the first activation mail. The notification can be deleted by clicking on the „Delete Notification“ button.